masonry restoration | Wilkens Contracting Inc. Here at Wilkens Contracting, we place emphasis on our relationship with our Toronto based clients when it comes to masonry repairs and all of their restoration needs. Fully licensed and insured, our company prides itself on our customer service. 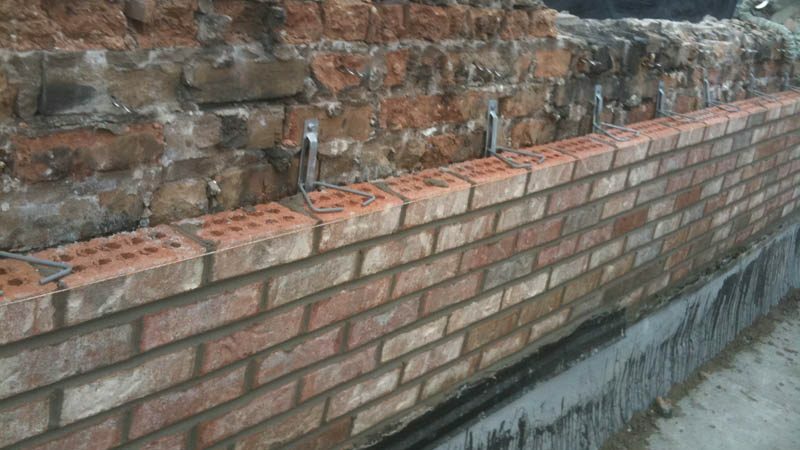 Making sure your brickwork and masonry are structural sound is what we do best. Read on to learn how Wilkens Contracting can help you and your masonry needs! Masonry refers to the building of structures using individual units, often bound together by mortar, and is a highly durable form of construction, as many structures throughout history have been built using this method. But all buildings need a touch up now and again to make sure the walls are structurally sound and performing their functions to the best of the materials’ abilities. Missing, cracked, or broken mortar is not a repair you should take lightly. As mortar binds and protects the brick themselves, it is an essential aspect of a structure and must be given the respect and care it deserves. As part of masonry services, we focus on maintaining the integrity of this mortar, known as tuckpointing. Whether you are looking for masonry repairs, brick restoration, or chimney and fireplace repairs and rebuilds in the Toronto area, Wilkens Contracting has you covered. Our company understands local weather patterns and the elemental damage that comes with living in a country with four very distinct seasons. With over three decades of knowledge and experience in the Toronto area, you are in safe hands when you choose Wilkens Contracting to do all of your masonry repairs. Much of our business is gained through repeat clients and their referrals, illustrating just how much Wilkens Contracting focuses on satisfying all of our customers’ needs. Not only do we get the job done right, but we also do it in a timely and friendly manner. We take our clients through a step by step process of their repair so they can understand everything we are doing and why. But don’t just take our word for it, check out what our previous clients had to say about our workmanship and customer service. As a family-based company providing masonry repairs to the Toronto area, Wilkens Contracting can serve all of your restoration needs. Give us a call at 416-425-8055, or contact us online to get the process underway! Wilkens Contracting sees the art and beauty behind perfectly executed masonry restoration. If you are in the Greater Toronto area and are looking for someone to repair your walls, fireplaces, or chimneys, look no further than Wilkens Contracting. Read on to learn why Wilkens Contracting is leagues above the rest! Technological progression of stonework and architectural integrity is what has propelled humanity into the future. With a focus on building bigger, better, and stronger structures, our history is filled with buildings that have lasted generations. This is all thanks to the builders who spearheaded innovative stone techniques and dared to try new materials and architectural forms. Here at Wilkens Contracting, we take the knowledge gathered through centuries of masonry work and use it in our twenty-first-century jobs to produce the highest quality stonework our clients can be proud of. Here at Wilkens Contracting tuckpointing is just one of the masonry restoration projects we can undertake. Tuckpointing is most often used for aesthetic repairs and maintenance when the bricks begin to spall (crumble and break apart on the surface). We focus on evening out the mortar joints of older brickwork to give an even and unified look to the structure. Our masons tint the mortar before applying directly to the joints, so the new material can blend evenly with the existing colours and shadowing. By doing it this way, Wilkens Contracting will leave your brickwork looking seamlessly vibrant so you won’t have to worry about the eyesore of patchwork or mismatched bricks. Take a look at all of our tuckpointing testimonials from our previous satisfied clients. Wilkens Contracting also offers other types of masonry restoration. We can create new openings in your walls for all of your renovation projects, whether they are window size, door size, or any size in between. Our company can also resize openings to fit new frames. Our masons have access to many types of antique bricks, so we can easily match the materials used on many older structures in Toronto, so you won’t have to worry about any unsightly repairs. Have a look at our photo gallery to see the seamless work with your own eyes! Wilkens Contracting brings that knowledge and understanding to every one of our masonry restoration jobs. We see the beauty in perfectly executed masonry. Our company takes pride in the work we do, and we want you to take pride in it with us. Contact us online and fill out our free estimation form to get your restorations underway!